You can scan an image to a variety of destinations uing your product's control panel. Note: To scan a multi-page document, place your originals in the ADF. 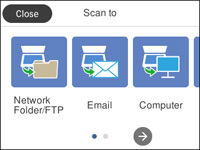 Computer lets you scan to a connected computer using your saved scan settings.